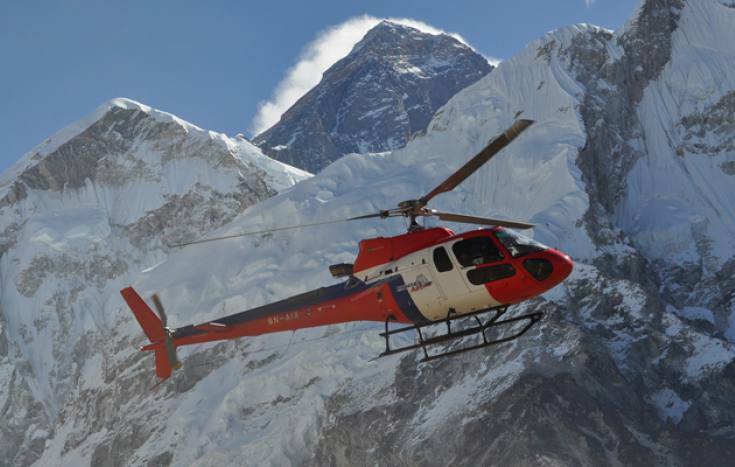 Helicopter Tour in Nepal going to remote corners of the Himalaya by helicopter is a pleasurable and exciting activity. There are three types of helicopters currently operating in the private sector. The most frequently seen is the powerful Russian-made MI-17. This is a big bird, capable of transporting four tons of cargo and can reach altitudes well in excess of 5,000 m.The other crafts is the smaller and more maneuverable French-made Ecureuil AS350B series and the Kawasaki BK 117. They are smooth and quiet and offer excellent visibility.Even if you can not go for weeks long trekking in the Himalayas still you have a chance to observe and feel the natural beauty of Nepal. Helicopter Tour is just for you and the easier way to visit Nepal. The Himalayan range in the north has more than 1000 peaks that are over 6000 meters, of which 8 summits are among the world's tallest, and of course, the one and only Mt. Everest is not to be missed. The fertile land in the south known as 'Terai' boasts of abundant wildlife. To add more to your itinerary, you have the Kathmandu Valley with its ancient cities, temples and monasteries, and the Pokhara Valley with its beautiful lake side town nestled in the lap of the Himalayas. Visit all these areas can be managed within a couple of days without any obstacles. Nepal, having high mountains and beautiful scenic countryside but is easily accessible by land transport, is known as "Helicopter Country." The helicopter services industry in Nepal is now well established with many types and categories of helicopters. The pilots are very experienced professionals with thousands of flying hours experience in Nepal. The helicopter service companies have excellent reputations and proven records for dependable emergency and rescue flight operations. There is eight Helicopter operating companies in Nepal.Here we would like to offer some of the wonderful helicopter tour to the Himalayan Nepal. Backpacker Treks Duffle bag, tour map and trip achievement certificate. Day 01Welcome assistance at the Tribhuvan International Airport and transfer to hotel. Afternoon half day tour. Visit Swayambhunath Temple and Patan City. Overnight stay at hotel. Day 02KATHMANDU - Helicopter tour Morning transfer to airport to connect "Everest Experience Flight". Later continue sightseeing tour of Bhaktapur, Pashupatinath, Boudhanath and Old Kathmandu City. Rest of the day free and overnight stay at hotel. Day 03KATHMANDU/RAFTING/CHITWAN Morning transfer to Charaudi - starting point of Rafting. It takes approximately 3 hours drive to the starting point from Kathmandu. After safety briefing given by the river guide we start rafting and stop for lunch. After lunch we hit white water section with a few class 3 rapids called "UPSET" and "SURPRISE". At the rafting take out point Fishling or Kuringhat you will be provided a hot cup of tea/coffee and drive to Chitwan. Evening enjoy cultural programme performed by local people and overnight at hotel. Day 04CHITWAN Morning Elephant safari and other jungle activities for full day. Overnight stay at hotel. Day 05CHITWAN/POKHARA Morning drive to Pokhara by Greenline Deluxe Coach/Car. Direct transfer to hotel. Evening free and overnight stay at hotel. Day 06POKHARA Morning half day city tour. Visit: Bindebasini Temple, Seti George, Mahendra Caves etc. Rest of the day free for individual activities and overnight stay at hotel. Day 07POKHARA/KATHMANDU/NAGARKOT Morning transfer to airport to connect flight for Kathmandu. Assistance at the airport and direct proceed to Nagarkot. En-route visit Bhaktapur City. Direct transfer to hotel. Evening witness sunset and overnight stay at hotel. Day 08NAGARKOT/KATHMANDU AIRPORT Departure Early morning witness sunrise over snowcapped Himalayan peaks. Drive to Kathmandu and direct transfer to Airport to connect flight for onward destination.